Microsoft has updated its OneNote app for Windows 8 and Windows RT to allow users to sign in and access notes associated with an Office365 account. In a company blogpost, Microsoft says the update provide instant access to recently updated notebooks from the app's menu. To access them, users need to tap the 'More Notebooks' drop-down in the left-hand menu pane before tapping a plus button in the bottom left that says 'Add a work or school account to see more notebooks'. After signing in the user's notebooks are revealed. 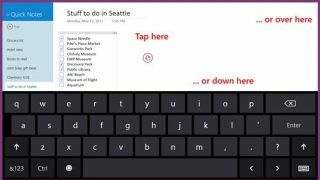 Microsoft has also changed the OneNote app's keyboard behaviour so that it can be dismissed by tapping into an empty space on the screen. When the keyboard is down, users can now tap anywhere to bring it up and start taking notes. To get the updated app, users need to tap on the store tile in Windows 8 before tapping Updates at the top right hand side of the screen. The app can be downloaded here. The update follows recent changes Microsoft made to the iOS and Android versions of its OneNote app, which removed a previous 500 note limitation and added formatting options and compatibility with Office365.